Military personnel have been banned from selling their stories to the media amid a growing row over the returned captives from Iran. The government made the move after captured sailor Faye Turney and her fellow hostages were accused of ‘behaving like reality TV stars’ after being given permission to cash in on their ordeal. Defence Secretary Des Browne said the Navy had faced a “very tough call” over its decision to allow the sailors among the 15 hostages to take payments in return for their accounts – the first of which were published today. But he said everyone concerned recognised it had “not reached a satisfactory outcome” and lessons must be learned from a review of procedures ordered by the Ministry of Defence. “I want to be sure those charged with these difficult decisions have clear guidance for the future,” he said in his first comment on the controversy. The 15 sailors and Marines had earlier been told they could sell their stories by the Ministry of Defence, which bracketed the “exceptional circumstances” surrounding their 13-day ordeal with winners of the Victoria Cross. 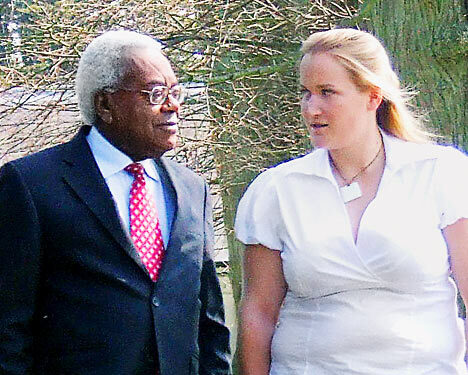 The most senior member of the crew Royal Navy Lieutenant Felix Carman had defended the right of comrades to sell their stories, but admitted he found the subject of being paid “a bit unsavoury” and said he would hand over any money he makes to charity. 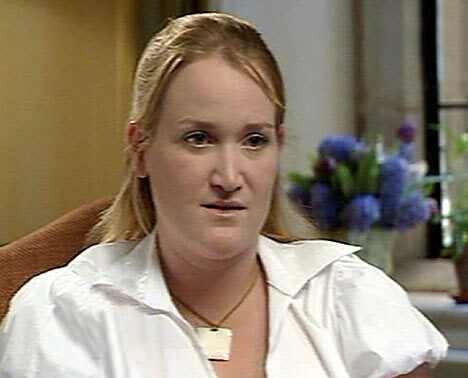 Before the latest developments Mrs Turney told The Sun how she feared she would be raped by her Iranian captors. The 26-year-old mother said she was separated from the other sailors and Marines, and stripped to her underwear. She said she “felt like a traitor” when ordered to write “confession” letters on Iranian TV. Iranian television also released fresh footage of the sailors and Marines aimed at refuting claims they they were mistreated. The video clips showed several of the sailors and marines dressed in track suits playing chess and table tennis. News that Mrs Turney alone is likely to make at least £100,000 was condemned by former Defence Ministers, ex-soldiers – and families who have lost loved ones in Iraq and Afghanistan. At Westminster, even some Labour MPs suspected a Government spin operation designed to distract attention away from embarrassing questions over the capture itself. 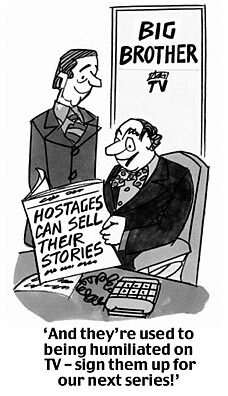 PR expert Max Clifford said he had been approached by the fathers of two of the hostages for advice on how to do a deal with the media. He described the decision as a “propaganda exercise” because it “suited” the MoD for the stories to be told. “They were very encouraging, they were very happy about them doing this, that’s the way they (the fathers) were putting it to me,” said Mr Clifford. Mike Aston, whose 30-year-old son Russell was one of six Redcaps killed by an Iraqi mob, said he was “absolutely amazed” by the “tacky and sordid” decision. He said: “Regarding my son’s death, I can put my hand on my heart and say that I’ve never sought or made a penny out of it. I think to actually sell my story would besmirch my son’s memory. On the unofficial website the Army Rumour Service, some contributors suggested the hostages who decide to sell should leave the Armed Forces – and all proceeds should be donated to families of those killed in Iraq. 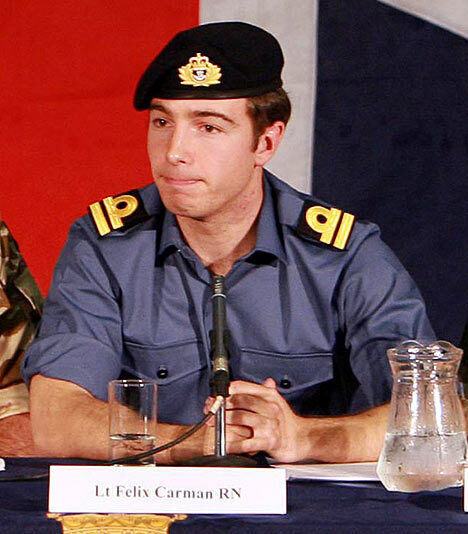 Lieutenant Felix Carman, one of the two officers captured by Iran’s Revolutionary Guards, said if he made any cash from his story it would go to charity. “I am not interested in making money out of this,’ the 26-year- old from Swansea told the BBC. “My main aim is to tell the story. There’s some people who might be making money, but that’s an individual’s decision. The parents of Marine Captain Chris Air said he would not be selling his story. “He’s not comfortable with the idea,” said his father Robin. “If others want to sell their story then fair play to them. Some aren’t on great salaries so this could change their lives. Serving military personnel are permitted to speak to the media, but only with the permission of their senior officers. Royal Navy Lieutenant Felix Carman from Swansea, admitted today that he found the subject of being paid “a bit unsavoury” and has said he will hand over any money he makes to charity. He told GMTV: “I personally find the subject (of being paid to speak) a bit unsavoury but I don’t begrudge people who have been through an awful ordeal making a bit of money out of this. In a separate interview with the South Wales Evening Post, Lt Carman said: “I am not interested in making money out of this. My main aim is to tell the story. Currently on compassionate leave at his parents’ home, Lt Carman said he had not thought about money at all and would “happily” talk for free. He said he thought the Ministry of Defence had allowed crew to sell their stories because officials realised someone was going to make money out of them anyway. It said the decision had been made because of the “exceptional media interest” and it would have “someone sitting in” on interviews with the hostages. Former Labour Defence Minister John Spellar defended the MoD decision. “I find it very odd that people who have never heard the sound of gunfire are going around criticising them,” he said.